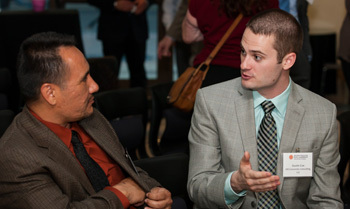 Arizona Center for Civic Leadership | Shaping tomorrow together. The Arizona Center for Civic Leadership works to strengthen civic leadership to improve the quality of life in Arizona to benefit future generations—a goal that mirrors the missions of its sponsors, the Flinn Foundation and Thomas R. Brown Foundations. The Center’s current major programs are the Flinn-Brown Civic Leadership Academy, the Arizona Civic Leadership Collaborative, and Communication on Civic Engagement and Leadership. The Flinn-Brown Civic Leadership Academy helps expand the cadre of future state-level civic leaders with the knowledge, skills, and commitment to address Arizona’s long-term issues. It is designed for Arizonans from all walks of life and perspectives who want to serve—whether full-time or part-time, paid or unpaid—as members of a state board, commission, or advisory council, an elected official, a state government executive, or a policy advisor. The Flinn-Brown Academy is a nonpartisan, applied program that brings knowledge of Arizona, public policy, and politics together to enhance civic leadership, expand public service, and promote decision-making for the common good. Civic leadership, as used in this statewide program, is the capacity to identify, analyze, and address issues through the collaborative efforts of citizens, private, public and nonprofit organizations.